This is a large capacity hard drive, plain and simple. Yet even hard drives come with added functionality these days, by way of differentiating them from their contemporaries. 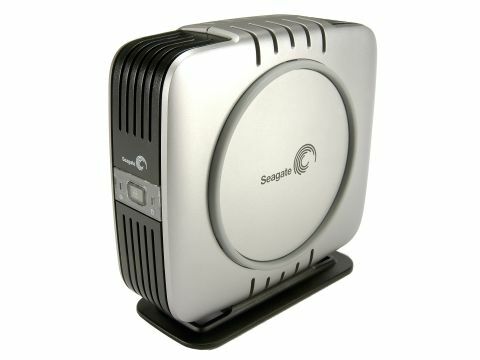 Seagate has been inspired by Maxtor in its attempt to create a onetouch back-up solution. Pressing the button that's on the front of the drive should update the backup of your PC stored on the drive. You'll have to create an initial backup though. The drive includes software that enables you to create that initial backup, too. BounceBack Express is designed to work with the one-touch backup button, but at the risk of repeating ourselves, only after you've created that initial backup using the software. Sadly, it's not the best example of restoration software we've seen. We found that BounceBack was hardly the most robust of applications - Iomega's, for example, works much better. It moaned when we tried to create our initial backup and it never really seemed much at home. You won't need any software for general drive use though. As you'd expect, the drive works seamlessly with Windows XP and 2000, although you'll have to install drivers for older versions of the OS. Because it's such a large capacity drive, it's also powered independently. Unlike smaller, external drives it can't suckle enough juice from your PC's USB port, so you won't be able to use it away from a power point. It's also fairly sizeable - the side is just larger than a CD case and the drive weighs 1.2kg. By way of compensation, the drive is dual USB2 and 400Mbps FireWire. Hitachi has recently announced a 500GB internal drive, but make no bones about it: Seagate's 400GB is no miser - it's a hell of a lot of storage! While £200 is a lot to spend on a backup drive you'll have no further problems in creating simple and upto- date backups of your PC's data once you get it all working properly. It's also a fair price for such a capacious amount of storage.